Dropdowns are one of the general elements present in any webpage, after buttons and textbars dropdowns are more frequently available element. 80% of the dropdowns are single value dropdowns, single value dropdowns are normal dropdowns on which you can select only one value, once you choose a value the dropdown shrinks. Look at the below clip : Once option is chosen the dropdown shrunken We can use only few methods present in Select class of Selenium webdriver for Single value Dropdown. 6. Select option which is at 1st position using selectByIndex() method in Select Class, Options starts from the '0'(zero). Sometimes we may need to select a option based on the value attribute, situations like the options may be shuffling or when options are dynamic. In such cases we must go either with selectByValue() or selectByIndex(). 2. If you want to select more options, press CTRL key on you keyboard and select options. 3. If you want to select x position to y position option, click x option and press Shift key and click y options, all the option between x and y will be selected. deselectAll()- removes the selected items from the selection. Custom dropdowns are built using different technologies like bootstrap, flask, django so on, but what we receive at our browser is none other than HTML code. These kind of pick and place tools will not follow standard coding but output will be same as original HTML. Dropdowns are formed using td, button, span, option, submenu tags, so in those cases we cannot use our Select class from the selenium webdriver. Lets take example : Goto Practice dropdowns page, you can find custom dropdown which uses below HTML code to form the dropdown. To overcome custom dropdown issue, we have to combine selenium methods to select value from dropdowns which are not formed by using select class. 3. Click the stored dropdown box. Check whether a dropdown is Single value dropdown or Multi Value dropdown ? We can verify whether a dropdown is single value dropdown or multi value dropdown in many ways. 1. isMultiple - this method is a non-static method of Select class in selenium webdriver. Verify Particular Option is present in dropdown or not ? We can verify whether a particular option is present or not in selenium webdriver. 5. compare the result text with expected result. 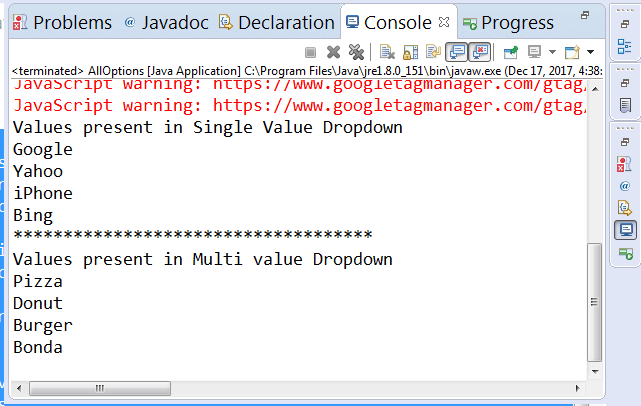 Selecting a value from dropdown is easier task but sometimes we may need to select option without using Select class. Method 1, 4, 5 are not applicable for custom dropdowns. We already familiar with Select class methods, we will learn how to use remaining methods in above list. We can use click method to select option from the dropdown, and this method is most preferred mether after select class methods. This is the simplest way to select dropdown option in selenium but sometimes this approach throws ElementNotVisibleException. We can use sendkeys method to select a option from a dropdown, first of all we have to find the dropdown element and use sendkeys method to select the option. We have to pass the exact text present in the dropdown option, if we donot send exact text, selenium webdriver chooses the almost exact match option which is in top. For example: If you want to choose option "22" but if you are sending "2" in sendkeys , selenium tries to set "2" only but if there is no option "2" but if there is "21" which is topper than option "22", selenium selects "21". Normal way, whenever somebody asks us this question we just start to think like Newton, but we never try to think in simple way. Are you kidding us ?? 2.3. Lets handle the Exception using try...catch block from java. 2.4. You should limit operation to finding the element itself, you should not try to click or do anything else. Try to select the given Option using selectByVisibleText(), here 'Avatar'. donot be mad at me :), think below steps. What happens when there is no such option ? which Exception it throws ? Ans: Again you are right, it throws NoSuchElementException. Can you handle NoSuchElementException ? Write what should happen when there is no such Option inside catch block. Yes, You have verified whether element is present or not. 5. compare the result text with expected result('Avatar'). We can verify whether a option is selected or not in a dropdown using selenium webdriver, and there are different ways to do it. Usually people think that isSelected() method is used to see whether a dropdown is selected or not, but in selenium webdriver isSelected() also can be used to check whether a dropdown is selected or not. 2. Find the required option as element, here we are finding option 'Google' as element. 3. Use isSelected() method on the element. It returns true if the element is selected or returns false if element is not selected. getFirstSelectedOption() method provides us option element which is selected currently, we need to extract the text from the element and verify the text with expected result. 4. Use getFirstSelectedOption() method to get the currently selected option. I did not found KarthiQ name amongst the authors of medium.com . with huge auditory they have ? even pay technical writers for the content . It is better to have our own place, is not it ? It is very thorough, comprehensive and easy to read and follow .